Banana pudding is a Southern dessert favorite. It’s no wonder. This luscious banana dessert is so easy to make, but hits just the right note every time you serve it. Combine 1/2 cup sugar, flour and salt in the top of a double boiler. Mix well. Sir in 1 egg, 3 yolks and milk. Mix well. Place over boiling water. Cook, stirring constantly, until smooth and thickened. Remove the mixture from the heat and stir in the vanilla. Spread 1/4 cup of the pudding in a 1 3/4 quart casserole. Arrange 12 wafers over the pudding. Top with 1/3 of the banana slices and 1/3 of the remaining pudding. Repeat the layers twice. 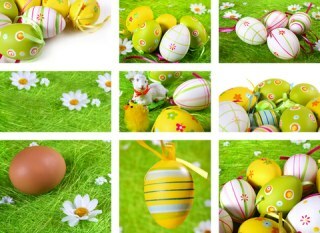 Beat 3 egg whites (at room temperature), at the high speed of an electric mixer, for 1 minute. Gradually add 1/4 cup sugar, 1 tablespoon at a time. Beat until stiff peaks form and the sugar dissolves (2-4 minutes). Spread the meringue over the pudding, sealing to the edge of the casserole. Bake at 350°F for 12-15 minutes or until golden brown. This recipe will be a hit at family gatherings, holidays, barbecues or a weekday dinner. You just make a simple vanilla pudding recipe, layer it with vanilla wafers and sliced bananas and you have a treat that is so good, everyone will want seconds. Delicious doesn’t have to be difficult. The banana pudding image show above is in individual servings, shown without the meringue topping. It is layered with whipped cream. 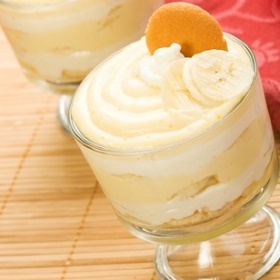 Banana pudding is just one of our luscious easy dessert recipes. Browse them all here.